While the merry, merry bells do ring. [solo] Make haste, make haste. [solo] What fish, my dear. 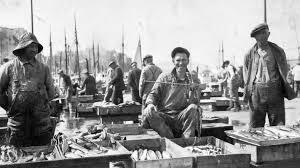 We cast our nets upon the rocks, &c.
We bring them fresh to market, &c.
There’s white and speckled bellied ‘uns, &c.
We sell them three for fourpence, &c.
We are three jolly fishermen, &c.